JAMES Forrest has knocked back a new four-year deal at Celtic. GARY Harkins has taunted Rangers by claiming that the side Dundee may face in the Scottish Cup quarter-finals is not the same as the Rangers he faced pre-2012. RANGERS loan winger Billy King says he is unsure if his Ibrox loan deal will be made permanent in the summer. RONNY Deila has warned he will axe lazy players at Celtic after admitting his squad is ‘too big’. RYAN Christie is eyeing up a starting role at Celtic as he competes with several other midfielders. The £500,000 signing was introduced in the 67th minute of Celtic’s 3-0 win over Inverness CT at the weekend. RAMON Vega has admitted the biggest mistake of his career was turning down the chance to stay at Celtic. KENNY Miller racked up his 100th goal in the Scottish leagues as Rangers took on Queen of the South at Palmerston on Sunday. FORMER Aberdeen player Jack Grimmer will line up against Manchester United in the FA Cup tonight. Shrewsbury star Grimmer recently scored the winning goal in a 3-2 victory over Sheffield Wednesday. CELTIC striker Leigh Griffiths only needs another 12 goals this season to make history in the SPFL. Henrik Larsson and Brian McClair hold the Hoops’ post-war record of 35 goals in a season. Griffiths needs to net 12 in as many games to surpass the record. The striker said: “I want to make a name for myself and the only way I can do that is by playing well and scoring goals. HEARTS coach Robbie Neilson slammed referee Kevin Clancy after Jordan McGhee was sent off during the 2-1 defeat to Dundee United. 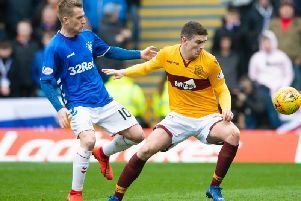 McGhee received a second yellow card for a tackle on Edward Ofere but TV footage suggested he played the ball.